The Ocelot is off to the Lakes Comic Art Festival in Kendal tomorrow with a bulging pouch of Grandville Miniatures. Look out for Bryan Talbot’s personal display of painted models, or buy your own from Forbidden Planet and Waterstones. Roving oceloteers Helena and Maisie are highly approachable and open to hellos and offers of tea. Look for the tall one in the red t-shirt or the normal-sized one dressed as Billie. This entry was posted in News and tagged Bryan Talbot, comic art festival, Grandville, LeBrock, Miniatures, Models, Ratzi on October 17, 2013 by Helena. 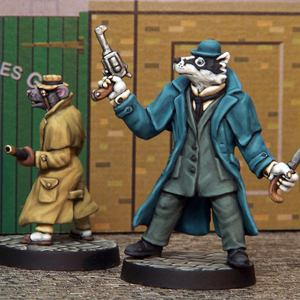 LeBrock and Ratzi are now on sale from Crooked Dice! Now with even bigger bases! Buy separately or as a pair. Click here to go to their webstore. This entry was posted in News and tagged Bryan Talbot, Crooked Dice, Figures, Grandville, LeBrock, Ratzi on May 1, 2013 by Helena. 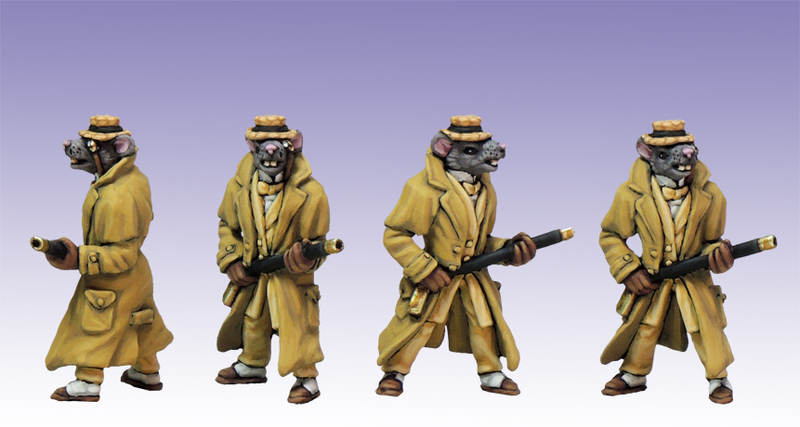 It’s just a couple of days after our big launch at Salute, and Grandville Miniatures are now at large among the public. 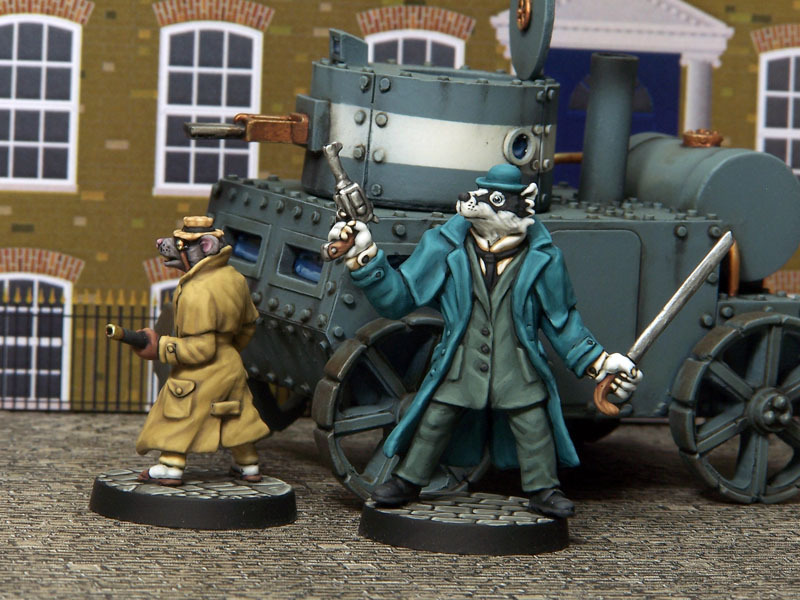 Here we see Detective Inspector LeBrock and Sergeant Ratzi in old London, pounding those mean, cobbled streets, courtesy of Kevin Dallimore’s painting and photographic skills. See the Gallery page for more pictures. This entry was posted in News and tagged Bryan Talbot, Grandville, LeBrock, Ratzi, Steampunk on April 22, 2013 by Helena. 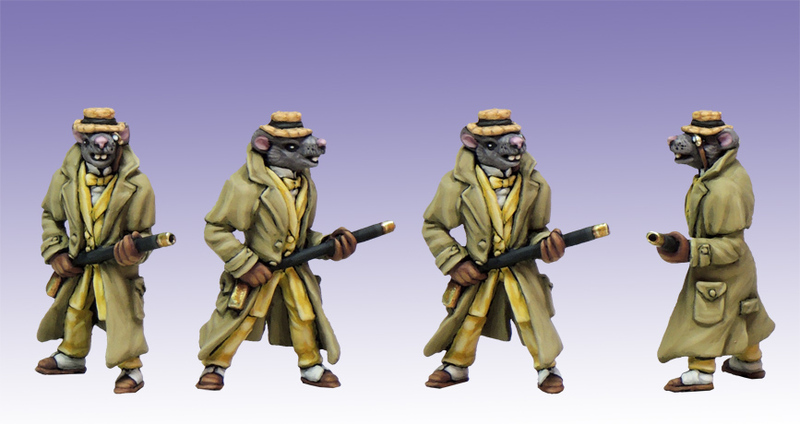 We are very pleased to share these beautifully painted pictures of our new LeBrock and Ratzi figures, courtesy of Kevin Dallimore. Shows what you can do with a keen eye and a steady brush hand. An impressive pile of LeBrocks and Ratzis are currently being bagged and tagged ready for our big launch at Salute this Saturday (ExCeL, London) on the Crooked Dice stand, and will be available for sale online shortly thereafter. This entry was posted in News and tagged Bryan Talbot, Crooked Dice, Grandville, LeBrock, Ratzi, Salute, Steampunk on April 18, 2013 by Helena. LeBrock and Ratzi in production! Our first figures of Detective Inspector LeBrock and Sergeant Ratzi of the Yard, are nearing completion. Sculpted by the talented Jo Brumby and examples here painted by Kevin Dallimore, the final metal castings should be with us in time to sell at Salute on April 20th (ExCeL, London) on the Crooked Dice stand. This entry was posted in News and tagged Bryan Talbot, Grandville, LeBrock, Ratzi, Steampunk on April 5, 2013 by Helena.